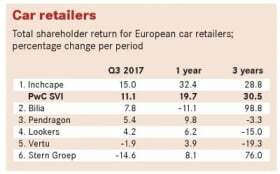 Europe's listed auto firms surged higher in the third quarter following weak performances in Q2. 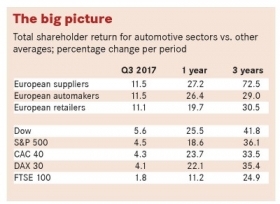 The latest Automotive News Europe/PricewaterhouseCoopers Transaction Services Shareholder Value Indices shows that the automaker and supplier sectors each gained 11.5 percent in shareholder value, with auto retailers close behind, up 11.1 percent, during the quarter. These gains are well ahead of the overall stock market performance during the period, when mainland European bourses recorded gains of between 4 percent and 5 percent and the UK's FTSE 100 was up 1.8 percent. However, as is often the case, these averages do not reflect the significant underlying variations in the shareholder value performance of individual companies within each sector. 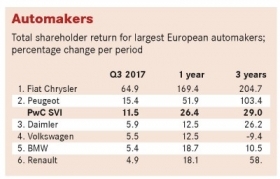 Fiat Chrysler Automobiles and PSA Group significantly outperformed their automaker peers in a period when everyone achieved some growth. FCA's 64.9 percent improvement coincided with its announcement in early August that it had signed a memorandum of understanding to join BMW Group's autonomous car alliance that includes Intel, Delphi and Continental. The companies are going to work together to develop an autonomous driving platform for global deployment. This followed a better-than-expected Q2 adjusted operating profit by the world's seventh-largest carmaker, helped by improvements in Europe and Latin America and continued strong performance in North America. The company's share price has benefitted, too, from market speculation about its future. CEO Sergio Marchionne fueled talk that it may spin off its Maserati and Alfa Romeo brands, along with its components operations, including Magneti Marelli. Analysts believe that such a spinoff could enable the Agnelli family, which controls Fiat, and other shareholders to unlock value in the way it did through the separation of another luxury brand, Ferrari. But the biggest impetus of all to the share price came from intense market speculation that Chinese investors may be interested in either acquiring its prized Jeep brand or the whole company. In late August, Wang Fengying, president of Great Wall Motor, told Automotive News Europe sister publication Automotive News that his company wants to buy Jeep and was "connecting with FCA" to begin negotiations. Although Fiat Chrysler subsequently denied that it had been contacted, investors believe this may only be the beginning of a long courtship that could, conceivably, entice other potential suitors from the Far East. Another Q3 winner was PSA Group, which increased its shareholder value 15.4 percent. Its strong performance followed the completion of its acquisition of the Opel and Vauxhall brands from General Motors. Gains by other manufacturers in Q3 were more modest, ranging from Renault's 4.9 percent increase to Daimler's 5.9 percent rise. This was still a big improvement on the preceding quarter, however, when only Renault showed a gain – a modest 1.1 percent – and the rest had lost up to 10 percent in shareholder value. 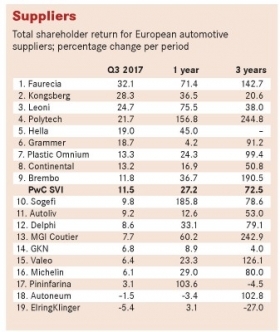 The good news for auto manufacturers had a positive impact on their suppliers, with all but two of Europe's 19 publicly listed partsmakers achieving value growth compared with just nine in Q2. Gains ranged from 3.1 percent for Italian design and engineering specialist Pininfarina to a strong 32.1 percent jump for French megasupplier Faurecia. Nine firms achieved double-digit percentage growth in the quarter. Faurecia is already the 8th largest international automotive parts manufacturer in the world and investors welcomed a statement by its CEO Patrick Koller that it is contemplating a "major" acquisition. This followed July's news that that it had taken a majority share in the Chinese infotainment leader Jiangxi Coagent Electronics for a total investment of 193 million euros, extended its partnership with Dongfeng to include its Clean Mobility business and entered into a new joint venture with Liuzhou Wuling Industry to develop and manufacture automotive seating products in China's Guangzhou province. Kongsberg Automotive, the Norwegian driver controls and cable specialist, increased its shareholder value 28.3 percent. The firm, which is closing of six facilities, reported that revenue was up 11 percent in Q2, with adjusted earnings up 54 percent. Other particularly strong performances were achieved by German-based wiring systems maker Leoni, up 24.7 percent, and Austrian test equipment maker Polytec, which boosted its shareholder value 21.7 percent in Q3. The supplier has been the most consistent performer in the sector in recent times. Polytec reported a 37 percent increase in earnings in the first six months of 2017 on the back of a 7 percent increase in sales. This followed gains of 30 percent in Q4 last year, and 27.7 percent in Q1 and 27.2 percent in Q2 this year. There was a sharp turnaround in the fortunes of the auto retail sector, where the Q3 gain of 11.1 percent followed a 9.2 percent fall in the preceding quarter. Here, too, the average figure provided an incomplete picture. On the strength of a set of good first-half results, the global retailer and distributor Inchcape managed to rebound from a Q2 drop of 10.9 percent in shareholder value with a 15 percent gain in Q3. The Netherlands' largest car dealer, Stern Groep, which had a 28 percent improvement in Q2, lost 14.6 percent in shareholder value in Q3. In 2016, Stern Groep acknowledged that the increasing availability of transport alternatives, especially in urban areas, means that owning a car is no longer a necessity. It is therefore now seeking to shift its focus from being a traditional dealer holding company into one offering such options as leasing, rental and alternative mobility services.